TORONTO — Future Projections celebrates the meeting point of cinema and the visual arts with a 2013 programme featuring installations from significant international and Canadian artists. This year, the popular and provocative city-wide programme is largely devoted to a single exhibition: David Cronenberg: Transformation — the visual art component of TIFF’s multi-faceted 2013 endeavour, The Cronenberg Project.Housed at the Museum of Contemporary Canadian Art (MOCCA), the exhibition, curated by Noah Cowan and David Liss, sees six significant artists responding to a specific theme in filmmaker David Cronenberg’s work: the yearning to witness the next stage of human evolution. Artists include: Candice Breitz, James Coupe, Marcel Dzama, Jeremy Shaw, Jamie Shovlin and Laurel Woodcock. The exhibition runs from September 5 to December 29, 2013. Future Projections will also feature Camille Henrot’s celebrated Grosse Fatigue, winner of the Venice Biennale Silver Lion, an exhibition of drawings by gonzo illustrator Ralph Steadman and a new installation by Radical Friend at the Drake Hotel. These works will be on display for the duration of the Festival, September 5 to 15, 2013. All Future Projections presentations are free and open to the public during the Festival. 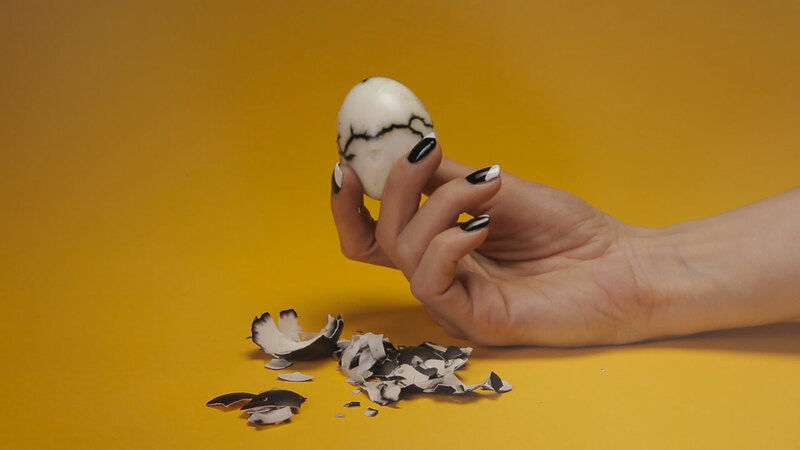 Multidisciplinary artist Camille Henrot won the Silver Lion for best young promising artist at this year’s Venice Biennale for her heady “encyclopedic” video, which mixes slam poetry-style narration with a percussive soundtrack as it describes an increasingly breathless excursion through the history of the universe. Presented in collaboration with MOCCA, 952 Queen Street West. Runs daily, September 5 to 15. As a complement to the documentary of the same title screening in the Festival’sMavericks section, this exhibition highlights the work of the legendary illustrator, Ralph Steadman, whose distinctively grotesque drawings — most famously for the books of Hunter S. Thompson — have placed him in the exalted company of artists Saul Steinberg and Robert Crumb. Presented at CIBC Canadian Film Gallery, TIFF Bell Lightbox, Reitman Square, 350 King Street West. Runs daily, September 5 to 15. Projected every night of the Festival onto the facade of the Drake Hotel, the new work from Radical Friend (Los Angeles-based directing duo Kirby McClure and Julia Grigorian) randomly collages images from contemporary mass culture’s darker expressions — murder, bikers, deserts — into a hypnotic, dystopic, multi-layered projection wall. Presented in collaboration with The Drake Hotel, 1150 Queen Street West. Video installation runs from dusk till dawn. September 5 to 15. The following installations make up David Cronenberg: Transformation. In this fascinating, unnervingly ingenious new work, artist Candice Breitz deploys her therapist, her parents and herself to redub a trio of key scenes from David Cronenberg’s eerily personal 1979 horror film The Brood, flushing out the film’s universal themes of relationship disintegration and parental anxiety. Presented and organized in partnership withMOCCA, 952 Queen Street West. Runs daily, September 5 to 15. Exhibition continues until December 29, 2013. The new film by Canadian-born multidisciplinary artist Marcel Dzama (featuring music by Arcade Fire and an appearance by former Sonic Youth frontwoman Kim Gordon) pays oblique tribute to the cinema of David Cronenberg while dropping playful art-historical quotations from Duchamp to Picasso, Beuys to Orsler. Presented and organized in partnership with MOCCA, 952 Queen Street West. Runs daily, September 5 to 15. Exhibition continues until December 29, 2013. United Kingdom-born, Seattle-based artist James Coupe fuses surveillance technology and social media in his new, JG Ballard-inspired installation. Presented and organized in partnership with MOCCA, 952 Queen Street West. Runs daily, September 5 to 15. Exhibition continues until December 29, 2013. For this startling new variation on his acclaimed installation Introduction to the Memory Personality, Jeremy Shaw places the spectator alone in a kind of cabin, where strategies around hypnotism and mind manipulation generate a profound sense of dread, a feeling that a buried taboo — in the form of a foreign body — has been shot directly into the brain. Presented and organized in partnership with MOCCA, 952 Queen Street West. Runs daily, September 5 to 15. Exhibition continues until December 29, 2013. The new project from British conceptual artist Jamie Shovlin is a fabricated documentary about the imaginary exploitation film Hiker Meat, which Shovlin created by splicing together 1,500 separate sequences from myriad low-budget slasher films from the last 30 years. Presented and organized in partnership with MOCCA, 952 Queen Street West. Runs daily, September 5 to 15. Exhibition continues until December 29, 2013. The newest installment of Laurel Woodcock’s site-specific series continues her exploration of the relationship between cinema and the written word by culling slug lines from the screenplays of David Cronenberg’s films and scattering them throughout the galleries of MOCCA. Presented and organized in partnership with MOCCA, 952 Queen Street West. Runs daily, September 5 to 15. Exhibition continues until December 29, 2013. Single tickets go on sale September 1. Purchase Festival tickets online at tiff.net/festival, by phone from10 a.m. to 7 p.m. ET daily at 416.599.TIFF or 1.888.599.8433, and in person at the Festival Box Office located at 225 King St. West. The 38th Toronto International Film Festival runs September 5 to 15, 2013.